128. 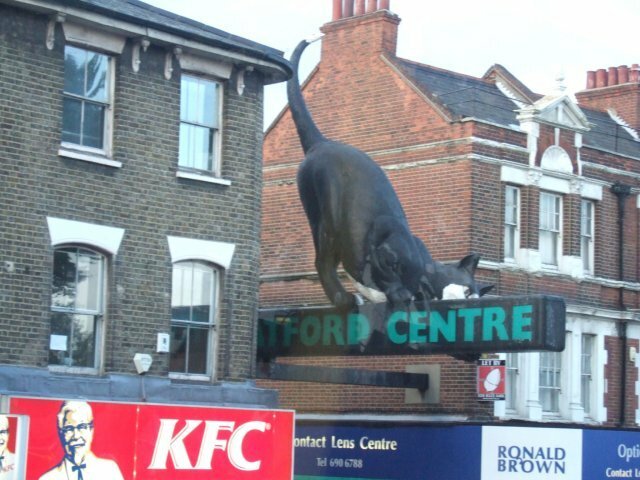 Putting the 'cat' in Catford! The recent 'Palace puma' and 'Sydenham beast' fiascos had kind of given reports of large, exotic cats a bad name. Firstly there were the media inaccuracies of the former - there was no puma - meanwhile the latter saw a poor domestic cat eaten in Sydenham Park by an unknown predator. The tale fizzled out however when a local woman claimed she'd photographed the beast - even though the picture showed a domestic cat. However, these kind of London legends fail to dissipate despite the scepticism. The train paused before entering Clapham Junction... and as I looked up between the gaps in the trees I saw a panther-type big cat prowling over near the opposite line, some distance away. It was very dark brown with a thick, long tail that curled up at the end. Was this another misidentification, or another of those sightings to suggest that yes some kind of large cat is roaming the outskirts of the city? Well, this report was backed up by a sighting that was reported on the Sydenham Town Forum, where a member named Coral reported that, one evening in September between 10:00 -10:30 pm, she'd spotted a large cat walking along in front of houses at Datchet Road, Catford. The animal was at least two-feet at the shoulder and a dark brown in colouration. Consider also that Catford is not that far from Sydenham, South Norwood, Bromley, or indeed Clapham when you realise just how far a cat can travel in a night. So, once again, don't be so hasty in dismissing reports of a mysterious animal which refuses to go away.